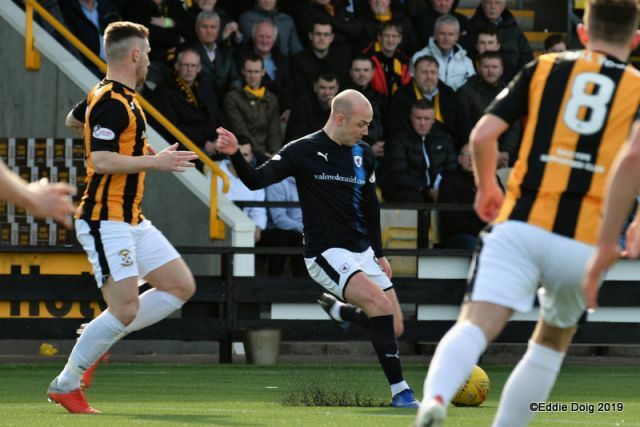 Raith took all three points from this pulsating Fife derby, with goals from Iain Davidson and Kevin Nisbet earning John McGlynn’s side a hard-fought win. 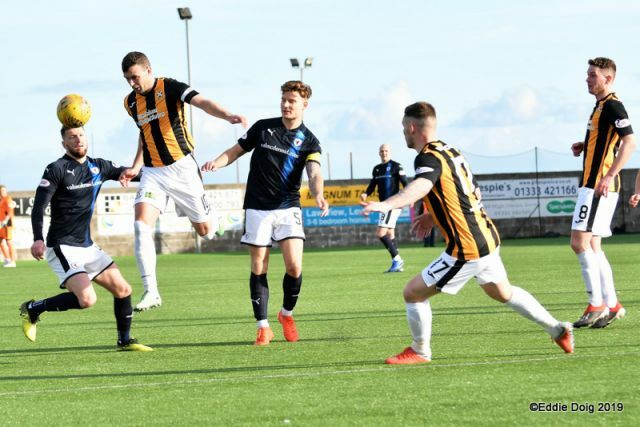 With East Fife having had the best of the first half and deservedly taken a half-time lead, Rovers had to dig deep to regain a foothold in the game – showing great strength of character to equaliser and steal the three points with two late goals. 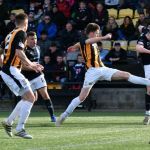 Despite Rovers having bombarded their hosts’ goal in the second half, East Fife looked set to secure the win following captain Kevin Smith’s first-half goal – only for Davidson and Nisbet’s late strikes to turn the tables on their rivals. 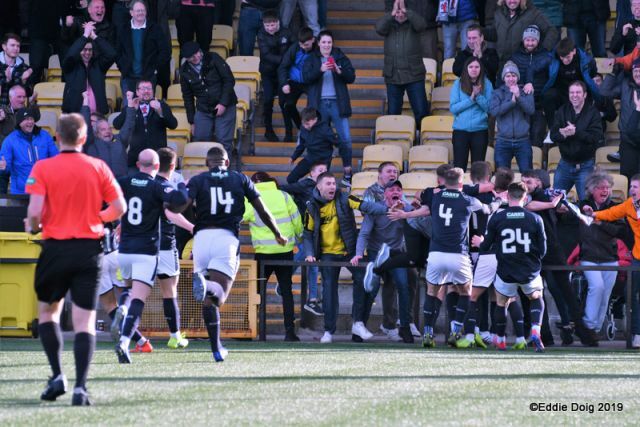 The final whistle saw triumphant and emotional scenes amongst Raith’s noisy travelling support and players alike, cheering a derby win and a significant three points. 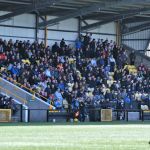 With bright clear skies to the west, and the Fife Energy Park’s enormous wind turbine spinning gently in the Spring breeze, it was a boisterous crowd which greeted referee Kirkland’s opening whistle. 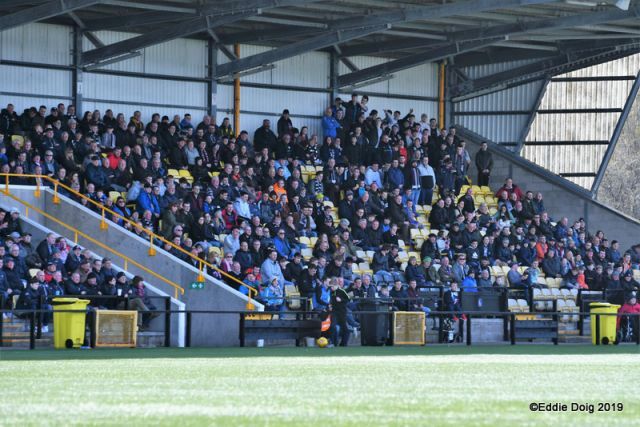 Rovers’ raucous travelling support was in full voice. 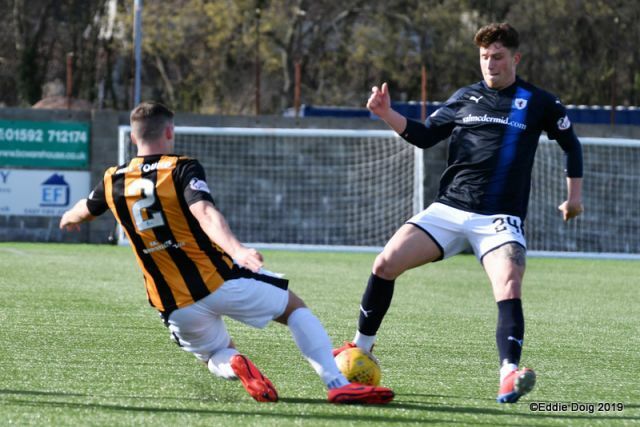 The visitors named an unchanged side – John McGlynn’s men turning in one of their best performances of the season in last week’s 4-1 demolition of Jim Duffy’s Dumbarton, till then one of the form sides in the Division. 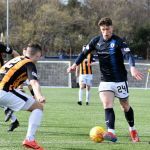 Liam Buchanan and Kevin Nisbet started upfront, with Matthews looking to support from central midfield. 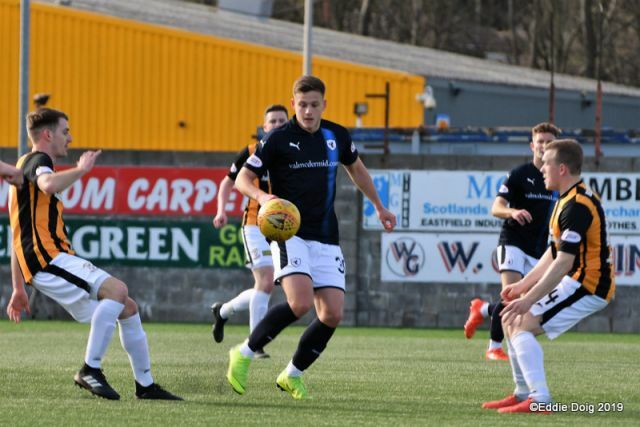 Loanees Gullan and Barjonas would provide pace and guile in support of their twin strikers. 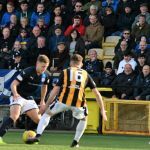 For the home side, the last Fife Derby of the season presented an opportunity to arrest a worrying run of form. 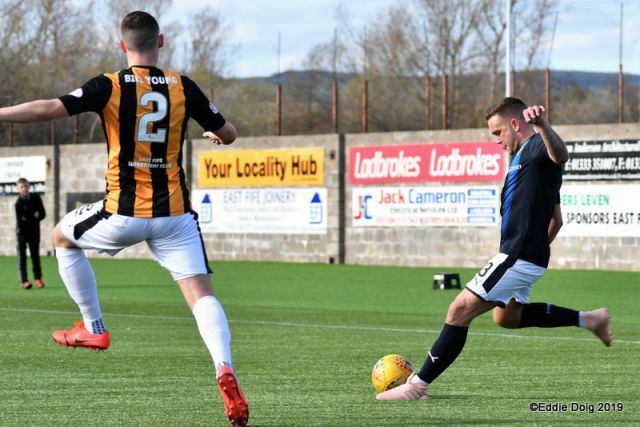 With Montrose hot on their heels for the final play-off place, Darren Young’s side had picked the wrong time of year to win only one in ten. 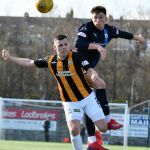 Mark Docherty and Jonny Court dropped out after last week’s disappointing home loss to Brechin City, but there was a welcome tonic with the return of captain Kevin Smith – restricted to 24 games last season with various injuries, the club captain’s recall gave Darren Young’s side a boost in the week the manager himself had signed a two-year contract extension. 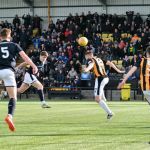 The home side had much to play for and much to prove. 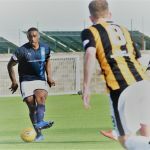 Rovers – looking to beat their near neighbours for the first time this season – kicked off toward the Forth, and started quickly. 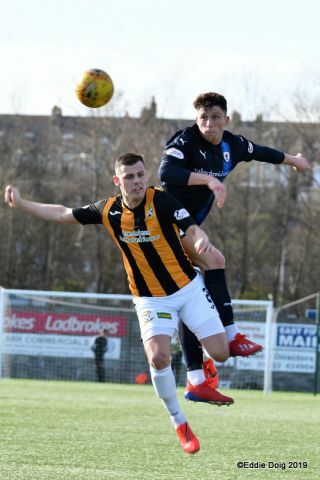 Nisbet and Barjonas exchanged a lovely one-two, the Rangers’ loanee stepping first inside then outside – keeper Long needed to look lively to block. 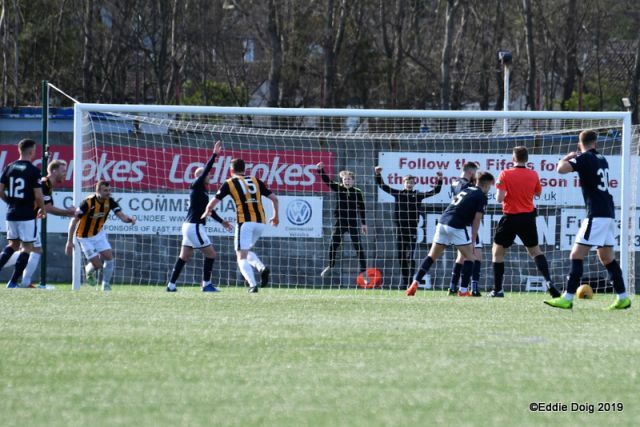 East Fife’s early nerves saw Higgins booked for a hack at Gullan – referee Kirkland taking no early nonsense. 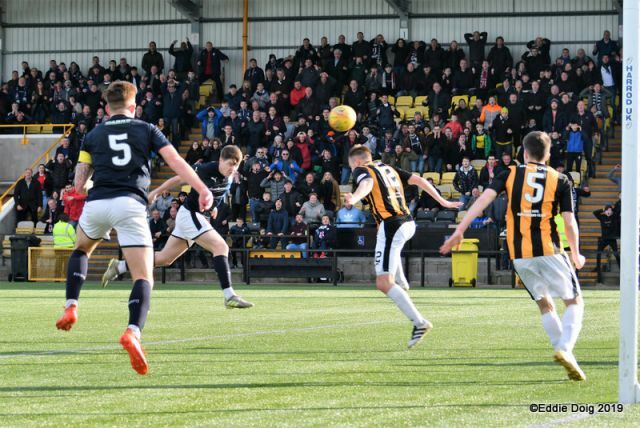 The home side’s first chance came after five minutes. 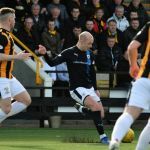 Murray and Davidson looked caught under a high ball, and Smith had a yard to shoot – the home captain’s effort flying over. 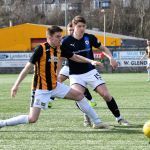 Moments later, Gullan played Buchanan in behind Dunlop; the home defender recovering at the last to crowd out the diminutive marksman. 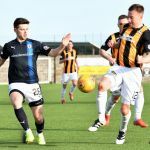 Right-back Gillespie won his first tussle with Smith on ten minutes, expertly turning the East Fife striker in full flow. 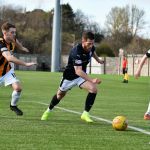 Although Raith were enjoying the bulk of possession, the home side were sharp and effective passing the ball. 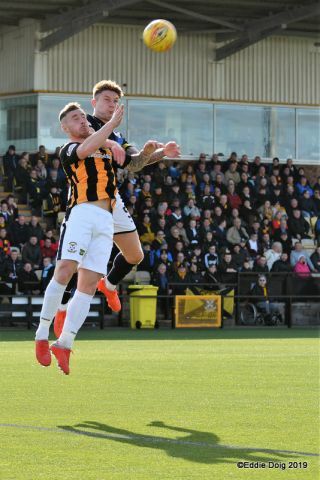 With a quarter of an hour gone, Angew and Smith combined to release Meggatt, attacking from left-back for the first time – the defender’s clipped cross just evading Dowds. 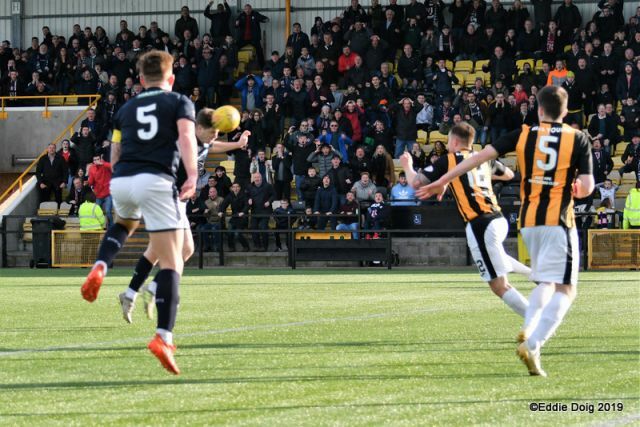 The flying Liam Watt nut-megged Crane before speeding inside, forcing a corner with a driven near-post cross – Ross Davidson’s drive sailing over Thomson’s bar from the set-piece. 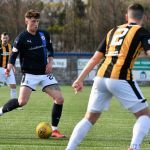 From a third corner in as many minutes, another Watt drive looked to strike Gillespie in the midriff – half-hearted claims for handball were summarily dismissed. 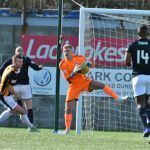 Raith sought to regroup having lost their momentum – Murray headed a corner narrowly over after Nisbet’s surge past Dunlop. 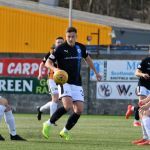 The home side came again – Dowds had a clear sight of goal, only to be denied by Davidson’s last-minute block; and centre-half Dunlop made for an unlikely winger, crossing into the six-yard box only for Murray to scramble clear. 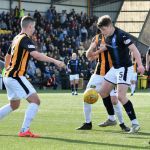 East Fife were in the ascendant; Raith manager McGlynn was apoplectic on the near touchline. 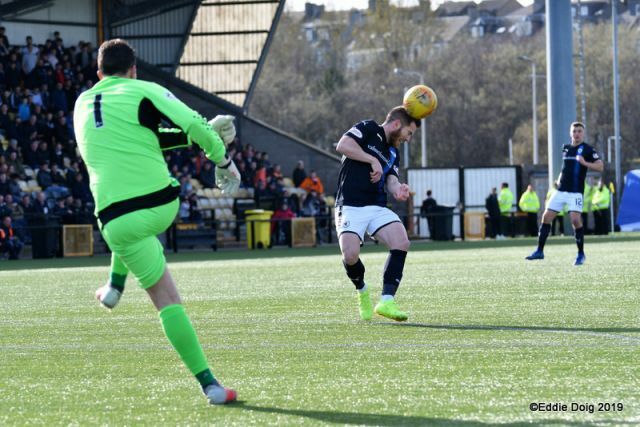 A defensive mix-up between Wedderburn and Davidson saw Slattery’s firm header nearly sneak beyond Thomson – the Raith keeper showing admirable reflexes to save low to his left. 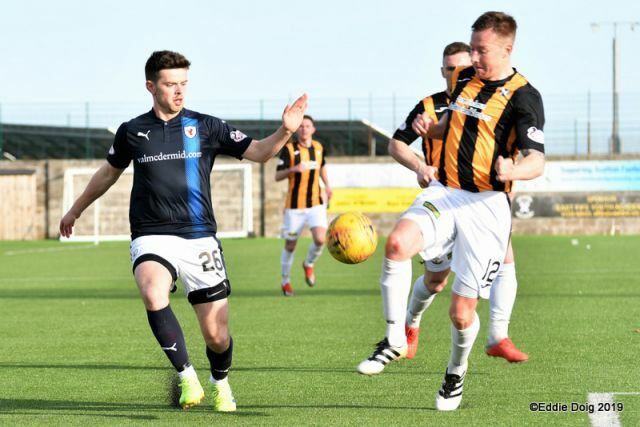 Another chance as the half-hour came and went – Dunsmore showed himself on the right-flank, playing Agnew into the Raith box on the angle. 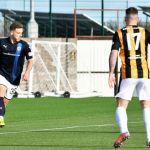 The quicksilver midfielder’s effort flew the wrong side of Thomson’s near post – manager Darren Young waved his troops forward, sensing their visitors were vulnerable. 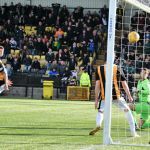 In the December fixture between the two sides, East Fife’s defence of Dunlop, Meggatt, and Dunsmore had been the difference – for a long spell in the first half, Buchanan and Nisbet found very little purchase against their rugged and determined opponents. 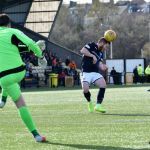 Barjonas, bullying his way past Dunlop, squared but to Gullan’s wrong side – the half-chance Raith’s only opportunity in a spell in which the home side were in command. 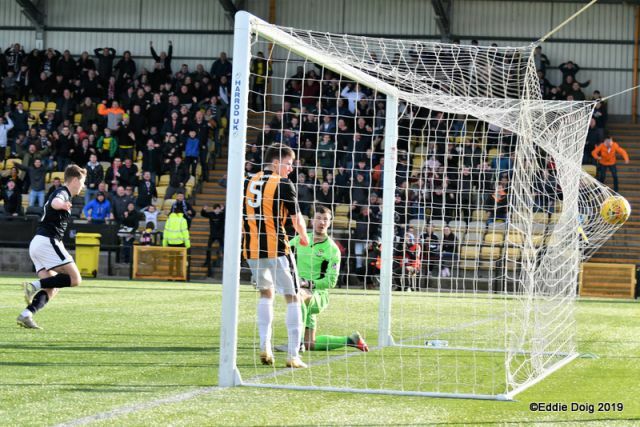 On forty-one minutes, the goal the home side deserved. 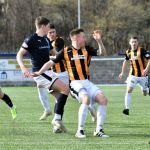 Dunsmore streaked past Crane and continued deep into the Raith box – his low cross beat Thomson at his near-post, leaving Smith the simplest of tap-ins. 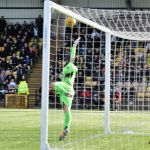 Dunsmore – the early scorer in East Fife’s December victory – was the key ingredient again here. 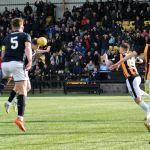 Although Raith rallied toward the interval, East Fife deservedly took their advantage into half-time. 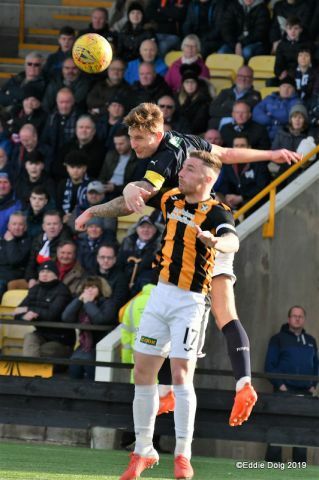 Despite their positive start, Raith had conceded the initiative to their hosts – of the two managers, it was Raith’s McGlynn with the sterner task at half-time. 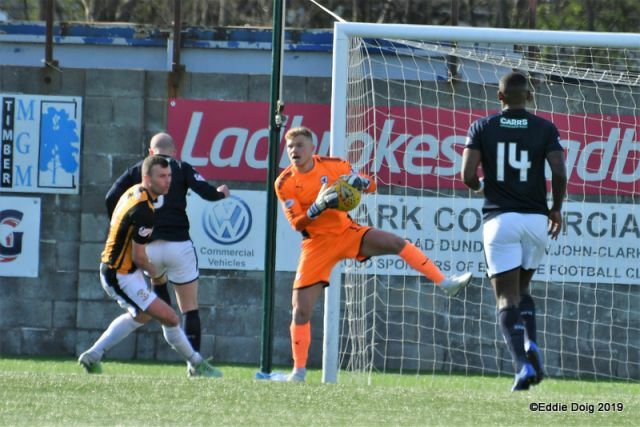 The opening minutes of the second half belonged to Raith – Nisbet barrelled into keeper Long under Gillespie’s high cross, and Barjonas looked poised to shoot at the far post, only for Higgins to clear. 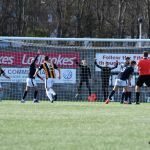 Barjonas, Crane, and Gullan combined well in tight spaces – weight of numbers in the home defence snuffed out several promising Rovers moves. 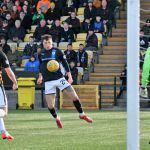 With their sole break of note in the opening exchanges, Agnew released Dowds whose athleticism brought out a sharp save from Thomson. 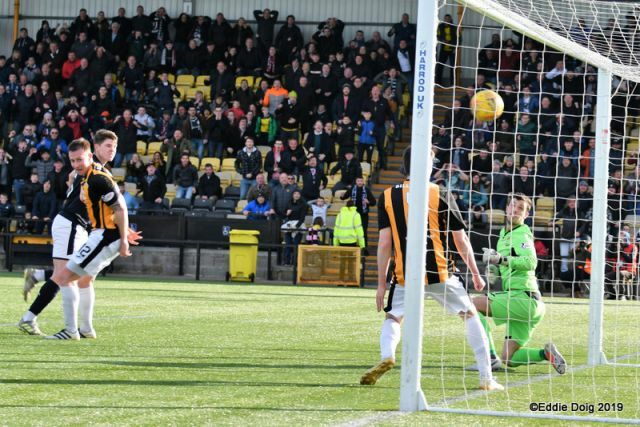 In fifty-seven minutes, and with Raith building a head of steam, high drama in the East Fife box. 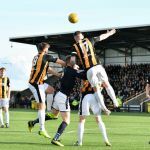 With Nisbet and Dunlop jostling under Crane’s cross, the ball clearly struck the defender’s raised arm. 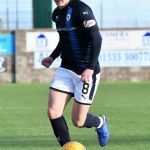 Was Dunlop’s arm in an unnatural position? 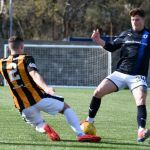 – undoubtedly; was Nisbet fouling his man? 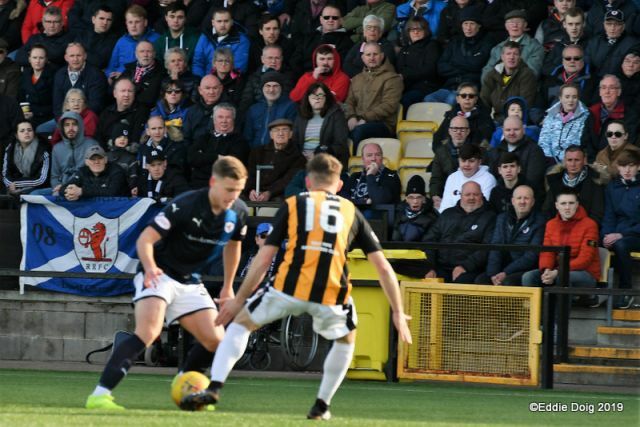 Referee Kirkland thought so, dismissing the loud protestations of the Raith striker – the home fans’ roars were borne of relief; Raith’s fans’ of anguish and frustration. 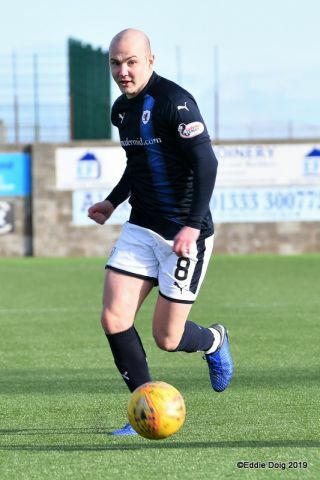 Temperatures rose. 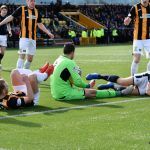 Murray was booked for a kick at Dowds; Slattery saw yellow for catching an escaping Gullan; Gillespie turned his knee in making a rash tackle on Agnew, hobbling to his feet as play raged on. 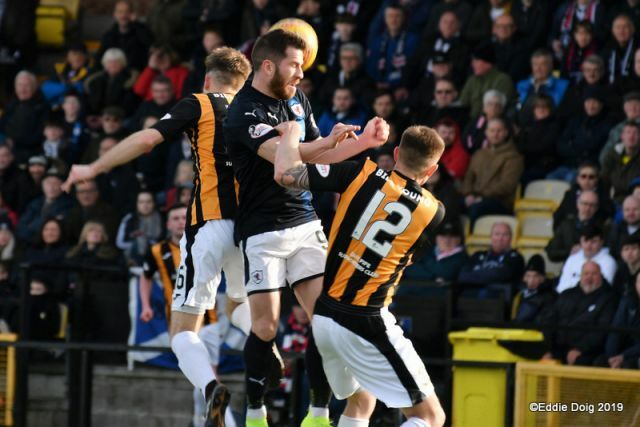 With twenty-five minutes left, Raith were camped in the East Fife half. 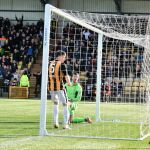 Crane’s whipped invitation flew through the East Fife six-yard box, headed away by Meggatt at full stretch. 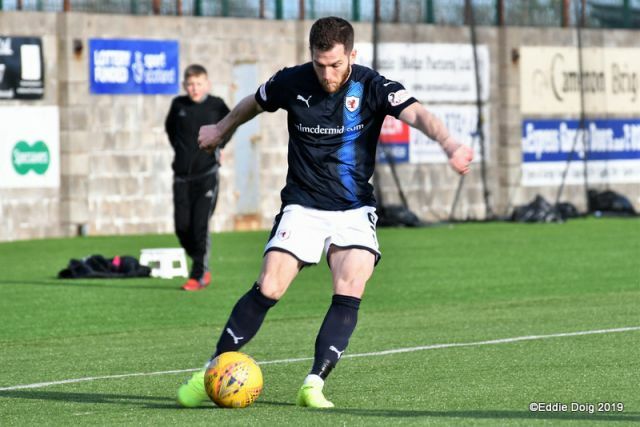 McGlynn shuffled his pack – Buchanan and Matthews withdrawn for McGuffie and Flanagan. 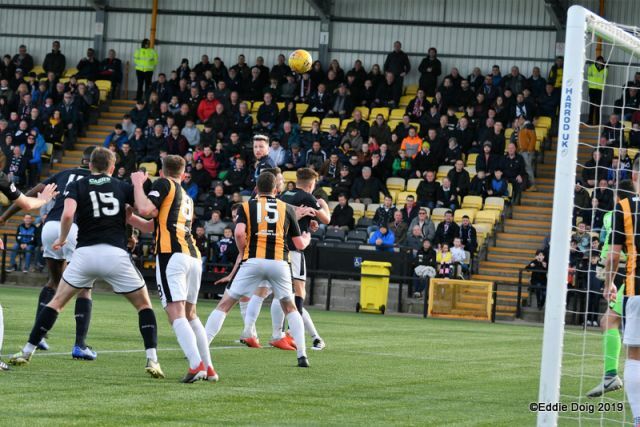 The former Ayr United man’s first contribution a lovely outside-of-the-boot pass to release Gullan, the latter’s shot bouncing wide. 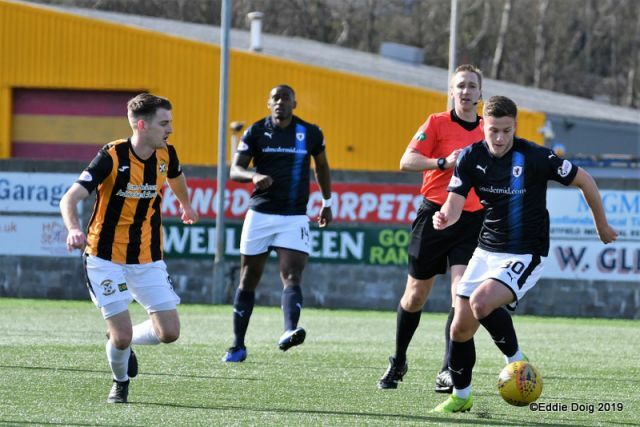 On seventy-one minutes, a wonderful flowing move as Barjonas linked with Gullan, Flanagan releasing Gillespie – the right-back’s woeful cross drawing every form of contumely from the away support. 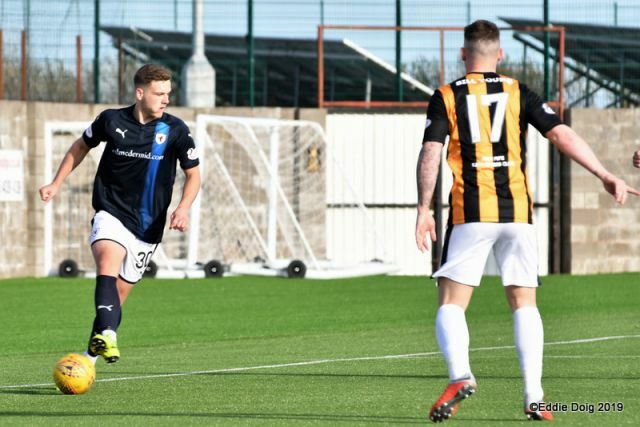 With ten minutes remaining, Rovers pressed again. 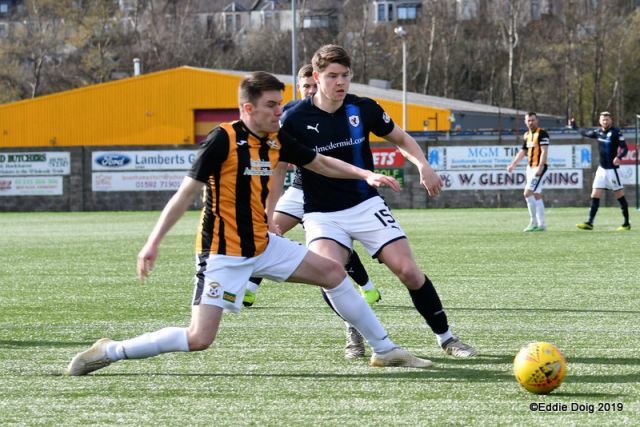 Flanagan skipped clear only to be tripped by Dunsmore – referee Kirkland again brandishing his yellow card. 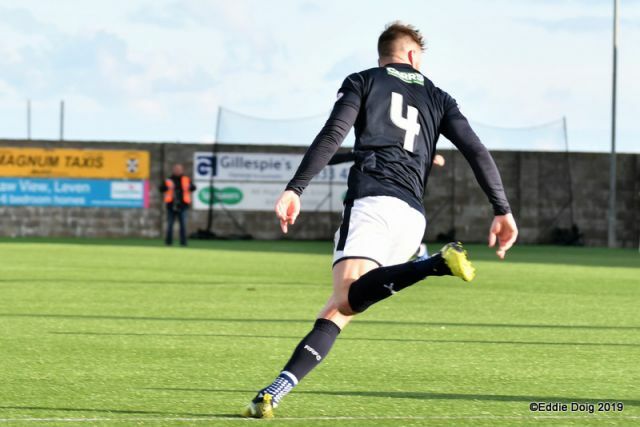 Gullan’s wonderful control under Gillespie’s Garryowen earned a corner. 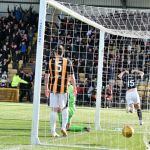 McGuffie’s zipping set-piece required Dunlop’s urgent attention. 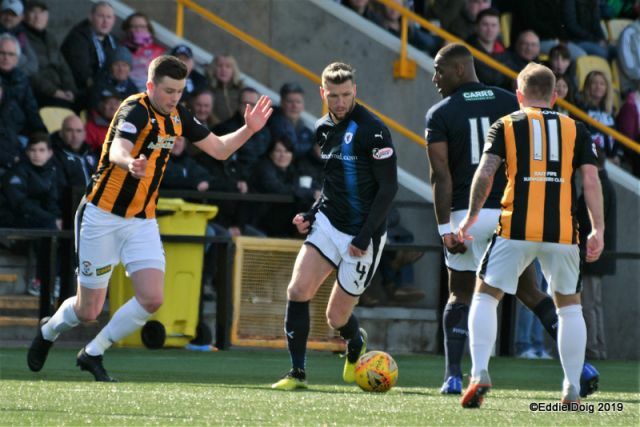 Barjonas’ flick to McGuffie allowed another pinpoint invitation from the influential substitute – Barjonas himself narrowly missing out at the far post. 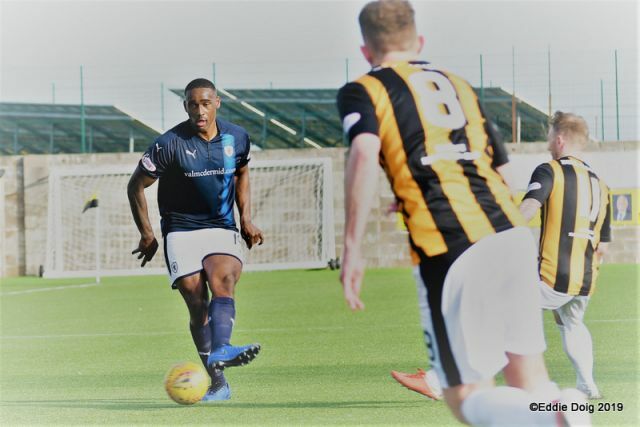 Another good chance came and went – Flanagan’s deep cross found Wedderburn, whose return header was cleared off the line by Meggatt; Davidson’s header was thumped away by Watt seconds later. 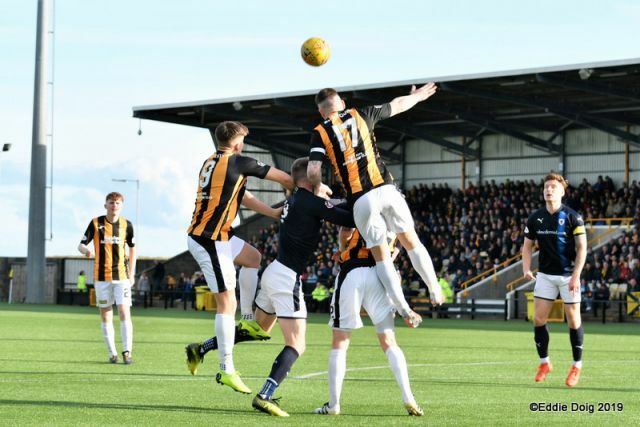 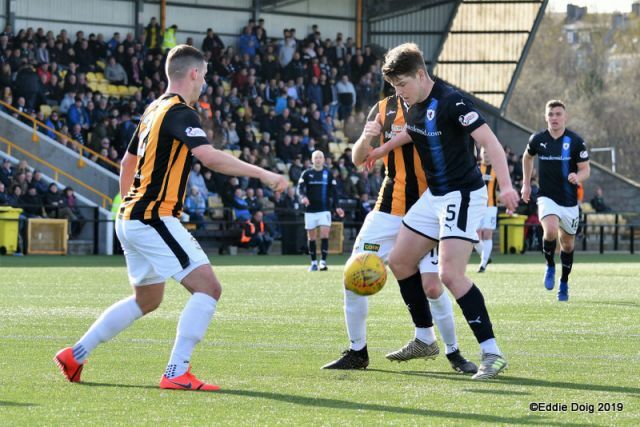 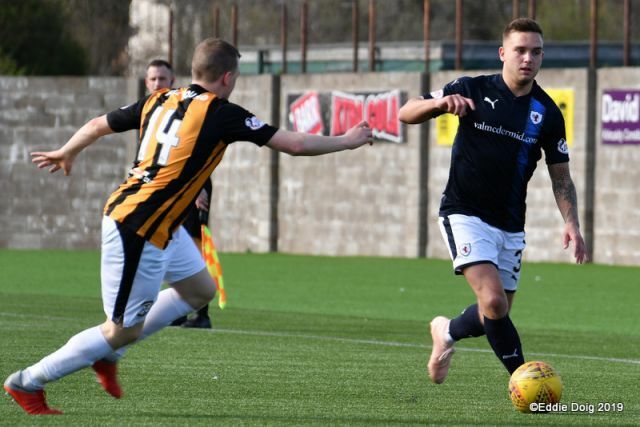 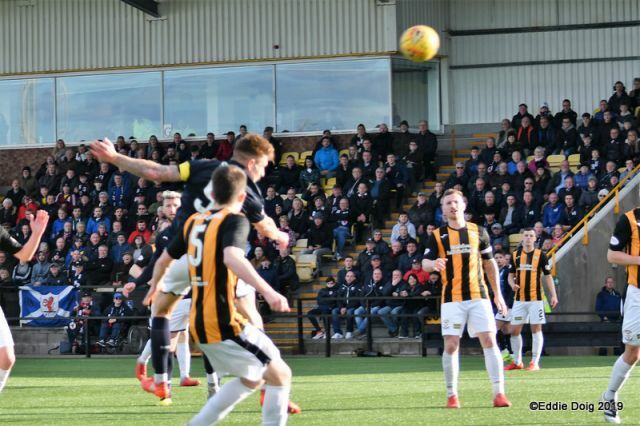 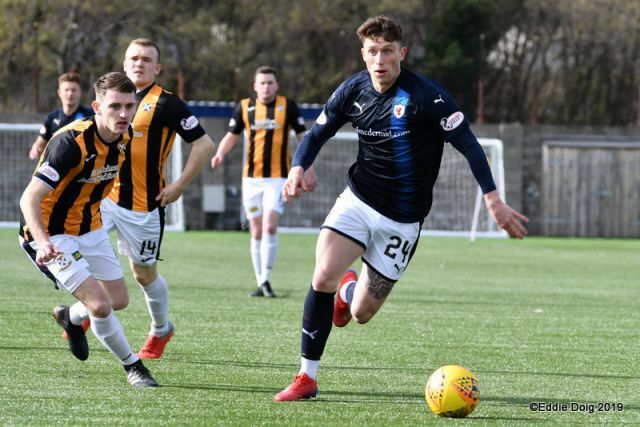 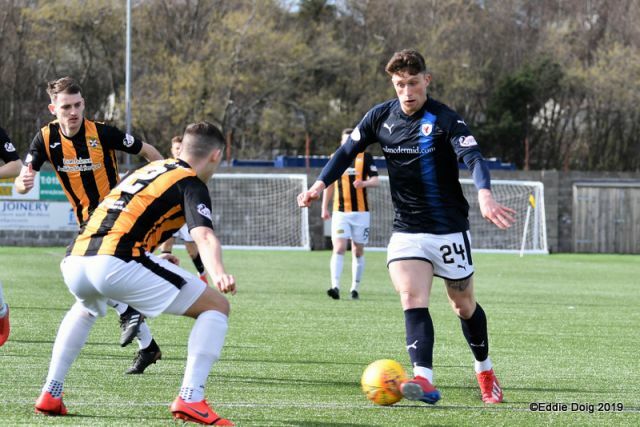 With five minutes to go, East Fife’s defences were breached as Raith’s pressure forced the equaliser their battling second-half performance merited. 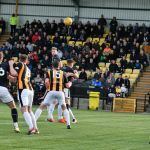 Flanagan allowed Crane to cross; an East Fife flick allowed Iain Davidson the chance to set himself and fire a fine controlled half-volley in at Long’s far-post. 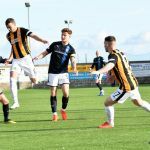 The defender took the plaudits with his excellent technique, but the goal was a team effort, bludgeoned past East Fife’s hitherto obdurate rearguard. 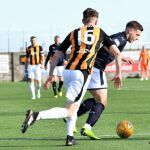 As East Fife restarted, suddenly Raith had their tails up and scented victory. 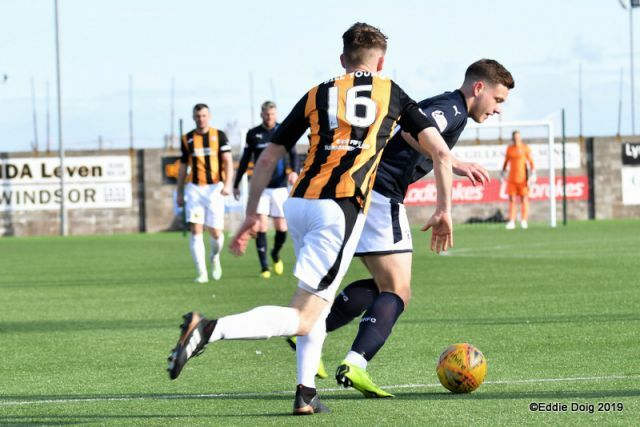 Two minutes later, pandemonium – McGuffie’s rasping volley fizzed into Long’s midriff; Euan Murray’s header clattered the bar, and Kevin Nisbet’s rebound sent Raith fans into raptures. 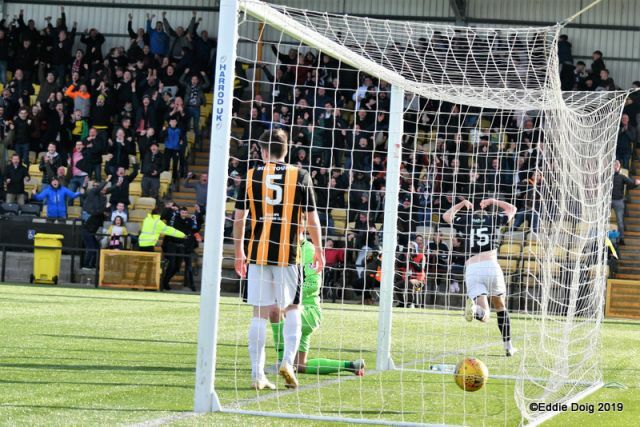 As the defeated home defenders sank to their knees in disbelief, Nisbet and the joyous away support became one in frenzied celebration. 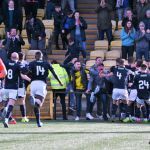 East Fife had one late chance – Gillespie’s defensive header just evading Dowds at full stretch – but referee Kirkland’s final whistle brought utter deflation for the home side, and unbridled joy for the visitors. 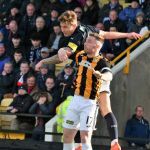 Manager McGlynn’s substitutions had re-energised Raith midway through the half – his side showing drive, determination, and no little skill in wearing down their resilient and robust opponents. 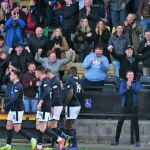 With five games to go, this win will give the Rovers players real confidence for the run-in and likely play-off campaign. 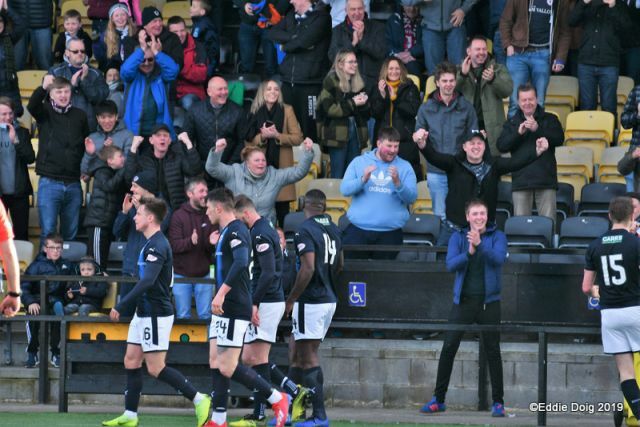 For Rovers’ travelling support, the euphoric scenes the chance to celebrate a deserved Fife derby triumph. 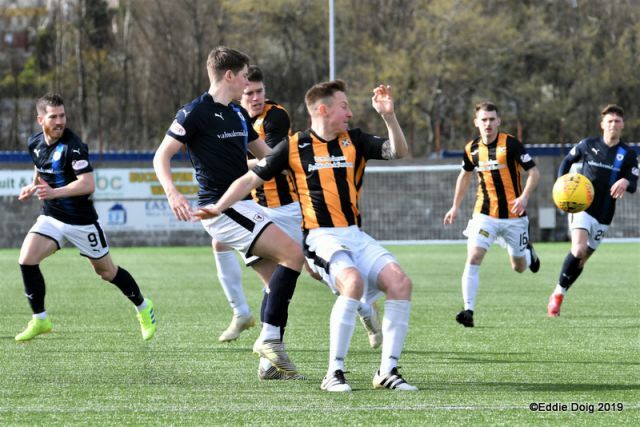 It’s the final Fife derby of the league season this Saturday, as Raith Rovers travel to Methil to play East Fife, still looking to register their first victory over Darren Young’s side this campaign. 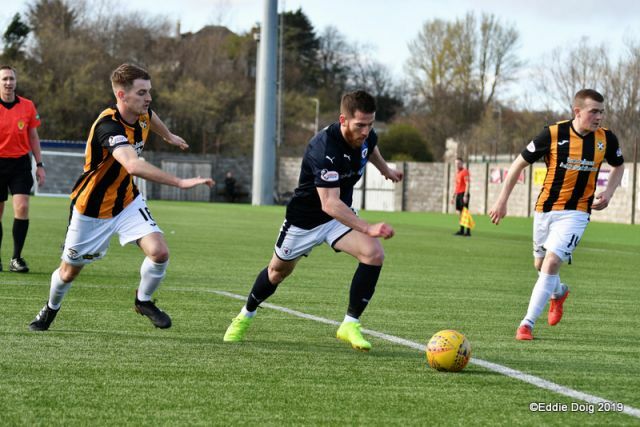 They go into the game on the back of one of their best performances in some time, a 4-1 win over Dumbarton, which lifted John McGlynn’s side above Forfar Athletic and into second place in the table. 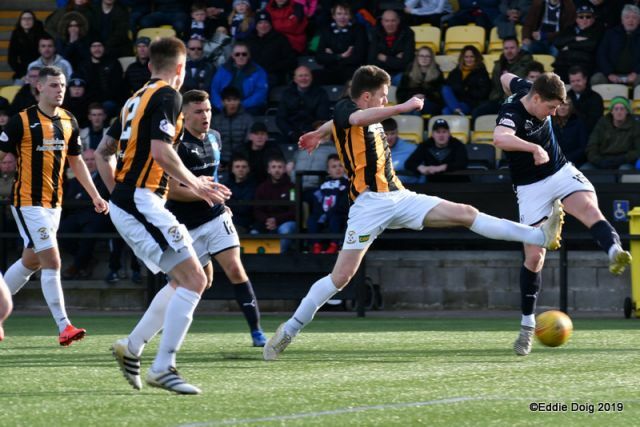 East Fife go into the game bottom of the form table, with just one win in 10 in all competitions, and while they still have a six point lead over Montrose in fifth, the Gable Endies have a game in hand in the race for the final playoff spot. 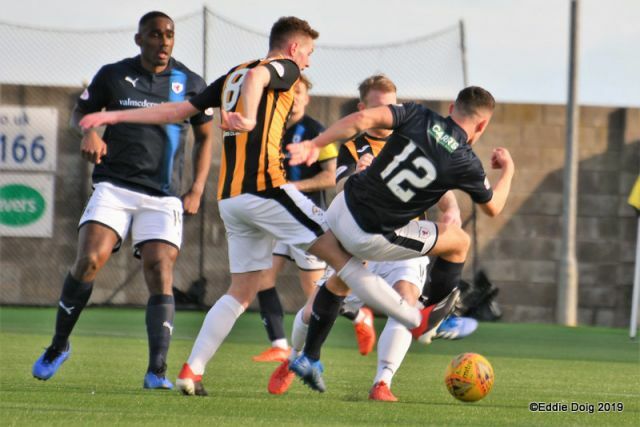 These two sides first met in August, with Rovers fortunate to escape with a point in a 2-2 draw, after being outplayed for large parts of the game. 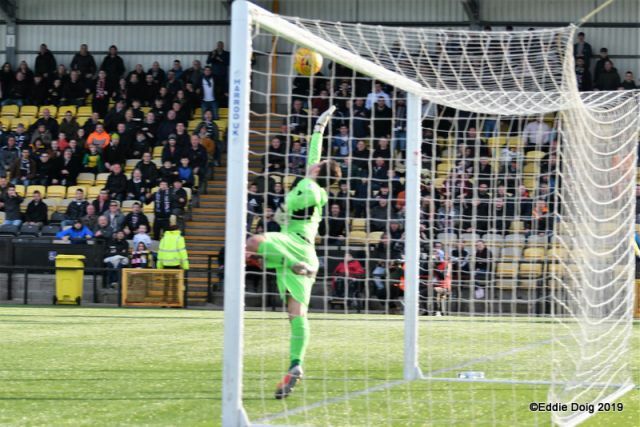 Kevin Nisbet was the man on the spot, with his two well taken penalties ensuring the points were shared. 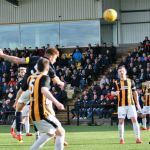 The next meeting was a dramatic match in November, when East Fife secured their first win over Raith in over 30 years. 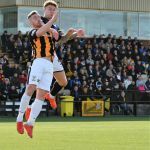 Liam Buchanan handed Rovers an early advantage, but an equaliser from Kevin Smith and a last minute winner from Aaron Dunsmore saw East Fife take all three points. 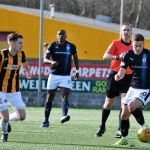 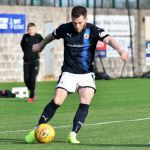 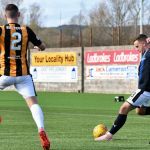 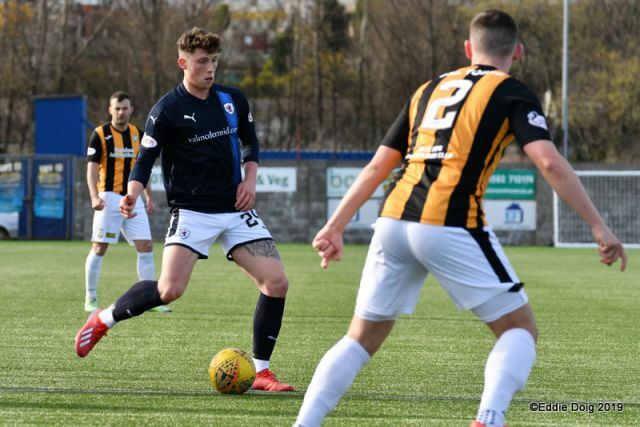 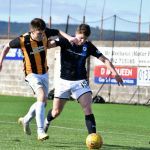 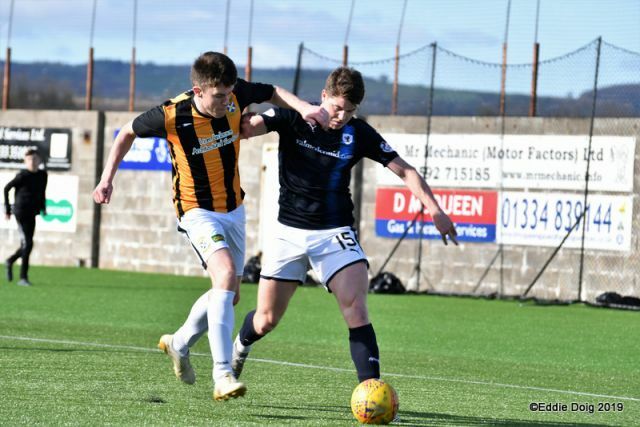 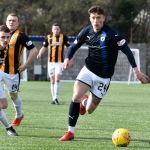 Dunsmore was again on the score-sheet when the two sides last met in December, as he and Rory Currie handed East Fife a two goal advantage, and despite a late goal from Nesbit, Rovers were unable to grab an equaliser. 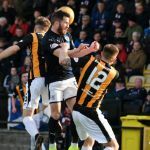 If Raith fail to win at the weekend, it’ll be the first time East Fife have went unbeaten against their neighbours for an entire league campaign since the 1974/75, a season which saw Rovers finish 13th in the old Second Division. 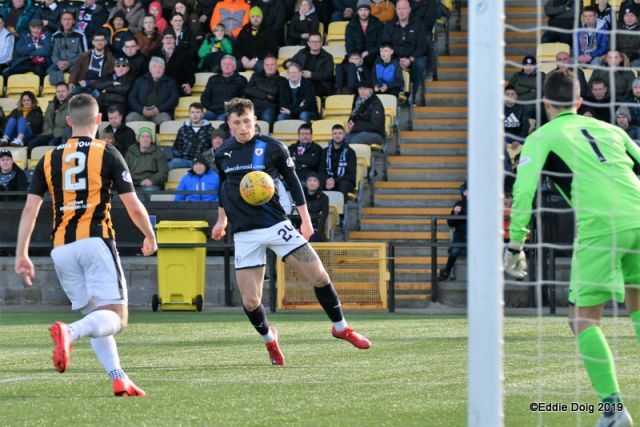 Rovers do still have a good record in this fixture, with seven wins and a draw from the last 10 meetings. 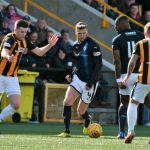 Saturday’s match referee will be Steven Kirkland.